-We are only one day removed from the Royal Rumble pay-per-view event which saw Randy Savage walk away as the victor in the Royal Rumble match. The Macho King last eliminated Hulk Hogan on his way to securing a WWF Heavyweight title match at WrestleMania VII. The Royal Rumble was not without controversy, however. In the WWF Heavyweight title match, The Ultimate Warrior defeated Sgt. Slaughter by pinfall. However, Slaughter's foot was on the bottom rope during the pinfall. We have learned that Jack Tunney will be making an announcement in regards to what happened at the Royal Rumble. It will be interesting to see what the WWF President has to say. -Having spoken of Randy Savage, he will be in action on this night when he takes on one half of the WWF World Tag Team Champions Bret Hart. The Hitman suffered an assault last night by The Russians following the victory by The Hart Foundation over The Orient Express. We're not sure what kind of condition Hart will be in for this match but a victory over the Macho King could definitely elevate him in the singles rankings. -Last week, we had a confrontation between Power & Glory with Slick and The Rockers on The Genius's Poetry Slam. This week, those two teams will see battle in tag team action. Both teams would definitely like a future WWF World Tag Team title match against The Hart Foundation. A win this week would definitely go a long way toward earning a shot at the titles. -There were a lot of surprise entrants in the Royal Rumble last evening. 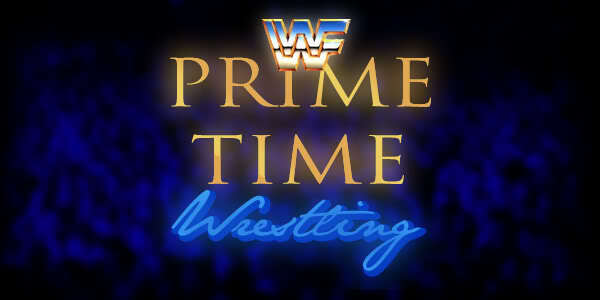 Some of those entrants will be making their WWF Prime Time Wrestling debuts or returns this evening. We will see men like Buddy Landel and Eddie Gilbert in action. The Nature Boy Buddy Landel was a bit of a disappointment to a lot of WWF fans. Many of them were expecting someone like Buddy Rogers or Ric Flair but Landel is no pushover and he begins showing that tonight. -Demolition make their return to the WWF following their suspension by Jack Tunney last month. Demolition took out Legion Of Doom member Hawk in the parking lot. Smash and Crush, led by Mr. Fuji, were suspended and fined due to this attack. Following that attack, The Bushwhackers are looking to gain some revenge for The Legion Of Doom. Which team will earn some momentum as we move forward? -Plus we will see Barry Hardy take on Jake Roberts, Piper's Pit hosted by Roddy Piper, Koko B. Ware and more right here on Prime Time Wrestling! Comments: Rick Martel blinds Roberts to escape and stay in the Rumble. Comments: Good match but the Hart Foundation retains. Comments: Perfect retains in another good title match. Comments: The Rhodes are out of the WWF not sure if they are able to resigned so I think they are going to WCW. Big John Studd, Dino Bravo, Earthquake, Haku, Ivan Koloff, Mr. Perfect, Nikita Koloff, Randy Savage, (Rick Martel? ), The Barbarian, (The Million Dollar Man? ), The Nature Boy, (The Undertaker? ), The Warlord, ?? ?, Big Bossman, (Dusty Rhodes? ), (Dustin Rhodes? ), Greg Valentine, Hulk Hogan, Jake Roberts, Jim Duggan, Jimmy Snuka, Ricky Steamboat, Saba Simba, The British Bulldog, Tito Santana, Tugboat, Wahoo McDaniel, ?? ?, ?? ?, ??? Comments: I think the Macho Man picks up the victory to go into Mania against Warrior. I think The Russians get rid of Hogan or cheat him to set up a Mania match between Hogan and Nikita. I would've predicted identically to this. The only thing I didn't think of was the Hogan/Nikita thing, as I thought it was heading to Hogan/Slaughter instead. Thoughts On Diary: Loving it so far! Just got caught up from the start! Thoughts On Royal Rumble: I love the level of detail put into the Rumble match itself! I wish the game allowed for that level of detail when booking the match! Comments: Landell wins his debut singles match probably with a Figure Four. Comments: Gilbert picks up his first singles win against Ware who will be a valuable guy to get people over. Comments: Steamboat wins an easy match. Comments: Had the Rockers but I'm switching to Power and Glory on this one. I can feel that they should be splitting up sooner than later unless you have big plans for them in the tag division. Comments: Squash match Jake wins easy with a DDT. Comments: Demolition picks up an easy victory. Comments: Savage just won the Rumble no way he is going to lose to Bret Hart. Thoughts On Royal Rumble/Dairy: Kinda sad that Slaughter failed to win the title, but I know the headline of Warrior vs. Savage for a World Title is just too good to pass up. Looking forward to see if Slaughter gets another shot down the road since his foot was on the rope maybe it becomes a triple threat match. I like the Royal Rumble several shockers looking to see what the new guys can do in this time period. Thoughts On Royal Rumble: Absolutely loved the match. Macho King had a good spot to win from, glad he triumphed over Hogan. Steamboat had a long run and got a title shot as well, so all's well there. Comments: Landel might not be the Nature Boy everyone expected to see but surely he gets past Costello. Comments: I could see this one going either way but going to follow the majority and go with Gilbert. Comments: No question on this one. Comments: Bit of a coin flip to me. Comments: Demolition picks up a win here. Comments: Bret isn´t quite there yet to beat names like Savage. Thoughts On Royal Rumble: It was a great Rumble. Very well written. So so so glad Savage won instead of Hogan. I would assume Hogan had to be protected for him to go through with the finish? Thank you to everyone for the predictions so far. I appreciate all the readers that I have and continue to have as we move forward. As you can see, the pay-per-views are definitely going to take awhile to get out. I hope everyone can understand that. The next Prime Time Wrestling show will be coming soon but before we get into that, a few comments. Hey EBEZA! Welcome to the show! I'm glad you're enjoying it so far and thank you for the comments and predictions. I'm glad to hear that you enjoyed the level of detail that I put into the Royal Rumble match itself. I can say that it took me several days to write it and I worried so much about repetition. Thank you so much for the support! Hey horseman4lyfe! Thanks for the predictions and comments! The Nature Boy swerve was a lot of fun to write in as the number 30 entrant. Landel was definitely a great talent that could have been more. I think part of the issue was his playing too much off previous Nature Boys. Will that change here? You can only read and find out. Glad to see you enjoyed the arrival of Eddie Gilbert, as well. That was another one that I enjoyed writing out with him hiding underneath the ring. Gilbert was, honestly, one of my favorite all-time wrestlers when I was younger. Seeing him in USWA and GWF was a lot of fun. Thank you, again, for the support. Hey RyanR93WKU! Thanks for the predictions and comments. Slaughter winning the title just seemed, to me, to be too predictable in following what happened in real life. I wanted a bit of a swerve to call things my own. Will he get another title shot? You just might find out in this week's Prime Time Wrestling. I'm glad you enjoyed the Royal Rumble. As I said above, it took quite awhile to get it actually written up. A few new guys and some guys that may only be a one time appearance for the Royal Rumble. Thank you, again, for your support. Hey Kijar! Thanks for the predictions and comments! I'm glad you enjoyed the Royal Rumble match. Savage winning, I am sure, was a pleasant surprise for a lot of people. He was my pick to win it from the beginning of this diary as I have made plans to WrestleMania VII already in advance. Steamboat's story arc has definitely taken an upswing despite him not winning the Royal Rumble match itself. As you said, he has a future Intercontinental title shot against Mr. Perfect. It's quite the consolation prize. Thank you, again, for your support. Hey lionsden03! Thanks for the predictions and comments. I'm glad you enjoyed the Royal Rumble match as well. As I said, it took quite a long time to write and I worried about repetitions as I moved forward. I hope it brought you and everyone else back to the real Royal Rumble. Hogan had to be protected and kept strong in order to lose the match. It was a bit of a sacrifice but one that I was more than willing to make to continue the story that I am building. Thank you, again, for your support. Last edited by angeldelayette : 02-25-2019 at 06:07 PM. The Wrestling Observer Newsletter is proud to bring you this prediction contest for the results of the World Wrestling Federation's shows. This prediction contest will run until the end of WrestleMania 7. Therefore, it will only end following March 1991. For each time you get the most right, you receive a point/win. The person with the most points/wins will get a special prize from the Newsletter and the World Wrestling Federation. Good luck to everyone. Last edited by angeldelayette : 02-25-2019 at 06:17 PM. -We are making our way closer to The Wrestling Classic which lies on the road to WrestleMania VII. This week on Prime Time Wrestling we are going to see a match that pits two of the top wrestlers in the WWF one on one as The Million Dollar Man goes up against Hulk Hogan in our main event! There is definite concern that Hogan might be looking ahead to The Wrestling Classic where he will face off against Randy Savage. Will Randy Savage play a part in this contest or will we see a clean match between two of the best? -At the Royal Rumble, we saw the return to the WWF of Stan Hansen when he attacked Jake Roberts. The man known as The Lariat will be in action for the first time on Prime Time Wrestling when he steps in the ring against The Birdman Koko B. Ware. Ware is definitely no slouch in the ring so this is no easy win for The Lariat. We could also see Jake Roberts play a part in this match, having that animal chemistry with The Birdman. Make sure you tune in to find out what happens. -On this night, we will see 10 teams compete in a tag team battle royal. The rules are simple, when one member of a team is eliminated, the entire team is eliminated. The winning team will face off against The Hart Foundation at WrestleMania VII for the WWF World Tag Team titles. There will be such teams as Earthquake and Dino Bravo, The Rockers, The Russians, Demolition and two mystery teams that will only be made known right before the match begins. One has to think that Earthquake has an advantage in a battle royal scenario or will everyone gang up on him at the beginning of the match to get him eliminated like we saw the field do to Buddy Landel at the Royal Rumble? -We will, also, see Virgil make his announcement on whether or not he is going to accept the WWF contract or return to The Million Dollar Man. We all know that Roddy Piper has been trying to convince Virgil to stand on his own two feet. But everyone knows that moving away from a benefactor is not an easy thing to do. This could be a banner night for The Million Dollar Man. -Plus we will see Mike Sharpe take on Wahoo McDaniel, The Undertaker's first match since joining the managerial services of Paul Bearer, Brooklyn Brawler versus The British Bulldog and more right here on Prime Time Wrestling! The Russians vs. The Nasty Boys vs. Power and Glory vs. Earthquake and Dino Bravo vs. Haku and The Barbarian vs. Demolition vs. The Rockers vs. The Bushwhackers vs. ??? vs. ?? ?